A combined outreach of Preschool, Grade 7 and 8 was on the go! 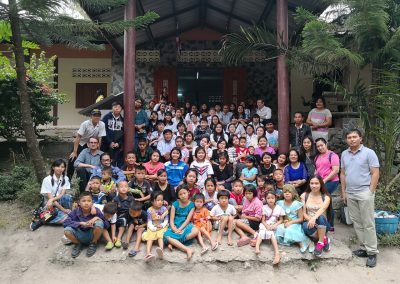 Though our journey was long into the mountainous ranges, yet the students could feel the quietness & serenity of life as we approach the site – Bilay’s house. When we arrived the spot, the children there, were filled with joy and excitement welcoming the unknown visitors. The look on their faces does not tell us their life’s conditions but it tells us how happy and content they are. We arrived right on time for the Sabbath program and participated in the services. The grade 7 students enacted the “Prodigal son” and the 8 graders gave a short motivational speech followed by a group song. All the students did their very best in their rendition and that brought blessings to Bilay’s house, the teachers and staff as well. A special Lunch prepared for the Bilay’s children were ever ready. It was a mouth – watering treat for them since they could never say when and from where their next meal would come. After Lunch, was another heap of joy. The gifts that were packed and sent by the Preschool students were presented to Bilay & his host of family by Mrs. Sophia Manduri head of Preschool Section and her team. As we travel back to Bangkok, each of us remembered the smiles of those children we left behind. In the midst of their struggles, they still have a “Hope of smile” that shines on their faces. That was a lifetime experience and a lifetime lesson for all of us. God is their giver and their provider and those who trust in Him, will lack nothing. We can be like those children radiating trust and Hope in God with those people around us. In behalf of RAIS, We in the Guidance Department expresses our grateful thanks to all who shared their blessings in cash and in kind particularly our Preschool, grade 7 and 8 students and parents. May God bless you all abundantly!